NOTE: TheMethosChronicles.net is no longer online. The URL now redirects you to the official Highlander site. TheMethosChronicles.net has posted an introduction and preview to the setting and some of the main characters in the Chronicles to come. Take a look before reading this review (otherwise, spoilers ahoy!). Little can be said about the story so far other than fans who are interested in Methos' origins will be intrigued. 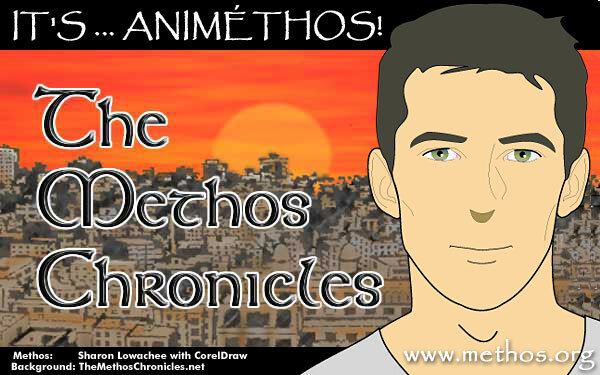 Fans who prefer Methos' origins to remain a mystery will want to dig out their eyes. Actually, you may want to dig out your eyes anyway after seeing what passes for art! Peter's voice and accent are lovely (as usual!) but he sounds like he's reading a storybook aloud to children instead of narrating as his character (like Joe the Highlander credits or the "Captain's log" voiceovers that are a staple of Star Trek). Dr. Abadi is quite nice. She resembles a less-well-endowed Lara Croft of Tomb Raider fame  in other words, she's drawn like a typical heroine in modern Western animation such as Disney's Aladdin. However, Dr. Khattemi looks like a shifty drug dealer, or the despot of a Third World country  I thought he was supposed to be a good guy! Sadly, Methos is the ugliest of all, despite a promising change in later concept artwork posted on the site. It makes me wish for a return of the overly stylized Methos depicted in the earliest concept art! In pondering why the animators can't seem to get Methos right, I poured over some Japanese anime art books then took a stab at drawing my own version of animated Methos (see the top of this page  the Methos drawing is mine, the background is from concept art posted on The Methos Chronicles site). My aim was to keep the drawing as simple as possible while still suggesting Methos. It seems the Methos Chronicles animators are taking the opposite tack  they're trying to capture Methos' look by adding more detail, not less, resulting in a very lined face that looks old, not to mention yucky. This goes against what I've deduced from my brief study of animation. That is, character likeness should be depicted in a few, clean, well-chosen lines NOT with detailed, fuzzy-lined sketches. In short, less is more. Not only is the artwork a disappointment, but the animation in the preview is similarly lacking. Before going into what's technically wrong with the preview, here's a short backgrounder on how the Macromedia Flash program works (or is supposed to work). Skip past this section if you're already familiar with Flash programming. In a Flash animation, each item that has to move is created as a separate drawing in an illustration program like Illustrator or Freehand or CorelDraw and imported into Flash as a "Flash object." (You can draw in Flash, but it's not really suited for complex drawings so it's cumbersome.) Animation is produced by moving these objects against a background. There are two ways Flash file sizes are kept low. First, the object itself doesn't change, just its location against the background (i.e. the file doesn't have to store another size-increasing graphic in it, just the math formula describing how the object moves). This is what gives Flash animation a "South Park" look. Second, the object is not created as a bitmap graphic (where the location of every pixel in the file has to be stored) but as a vector graphic (where just the math formulas describing how to draw the graphic is stored). JPGs, GIFs and PhotoShop files are stored as bitmap graphics. EPS, Illustrator and Freehand files are stored as vector graphics. The advantage of vector graphics is that the file sizes are much smaller and you can increase the size of the image infinitely without losing picture quality. Flash DOES allow you use bitmap graphics. And it is TECHNICALLY possible in Flash to do traditional style animation  you just have to use different graphics for each movement change as in traditional animation. However, these things increase file size tremendously, and thus should only be used sparingly. So the challenge for Flash animators is to minimize the amount of bitmap graphics needed (for example, using them only for painted-style backgrounds), and minimize the amount of graphic objects needed in total, while still making the animation artistically pleasing. The use of bitmap graphics is crappy  sometimes the pixels are too visible. There are too many different "styles." Some drawings are photographic bitmap textures. Others have a "painted" look. Some drawings use solid color fills. Others use colored gradations. In some cases images in the distance are blurred for a photographic effect (the raft scene) and in others they're not (the pyramids scene). The result is an extremely uneven look rather than a strong unified artistic style. Why are all the black outlines for the images fuzzy instead of clean? Why can you see white "cutout" lines around some images? Why is the text "Treasures of the 1st Dynasty" fuzzy? Because they're bitmap graphics! Many of the graphics look like they were hand drawn, scanned in, cleaned up in a graphic program, then imported into Flash (i.e. all the Flash objects are bitmap graphics) when the graphics should have been drawn in a vector illustration program to begin with. This is by far the most serious problem with the preview. It's an unpardonable sin! Flash is a vector graphics animation program. Therefore, the less an animator uses vector graphics, the harder it is to make Flash look good. In general, you can divide the fundamental skills needed to use Flash into three job descriptions: (1) an illustrator familiar with vector graphics programs, (2) a programmer who knows the ins and outs of Flash technically, and (3) an animator who has an artistic and cinematic eye for how to place and move images. To me, it looks like whoever's doing the Methos Chronicles lacks skill (1) and has only an intermediate understanding of skills (2) and (3). Below are some links to professional quality Flash animations. Take a tour and see the HUGE difference in quality between them and what we've seen of the Methos Chronicles so far. The drawings are waaaay cleaner and the animation (how the camera "moves" as well as how the images themselves move) is generally slicker. The best place to see the limits of what Flash (and its sister technology Shockwave) can do, not to mention the most entertaining site just because they have so much stuff there, you're bound to find something you like. Go the the "Shows" link and check out REGURGE for hilarious music video parodies. There's also STAINBOY if you like Tim Burton's warped sense of humor and Joe Cartoon for even more warped humor. There's even South Park episodes done in Flash. And tons more. The Sci-Fi Channel has several Flash series going in many different styles. ECLIPSE is the most similiar in artistic style and execution to what I'd like the Methos Chronicles to be. Star Wars-themed animation done by amateurs. Check out FINDING CHILD and SHAY TILNAER for animated series. STAR DUDES and its sequels are cute and hilarious parodies. Some of the animation on the site is traditional animation exported to QuickTime. You can see the difference in file size  10 MB per minute for QuickTime vs less than 1 MB per minute for Flash! The intro to the site is unusual  it's a Flash animation made with bitmap graphics. They break the rules but it's done well! The website for the film The Messenger. Another bitmap-graphic-heavy animation but like the Harry Potter intro, the intro to the Flash version of the site is a great example of how Flash can be used for a cinematic effect. It's optimized so it loads extremely fast too. This is also a good example of a website done totally in Flash. The website for the animated film Princess Mononoke. It's a good example of a website done totally in Flash and of how Flash can be used along with traditional animation artwork to good effect. Has several mainstream (non SF&F) Flash series. They tend towards comedy and "arty."